Digital polls are a great way for an online crowd to express their opinions towards a set of items on the list. In the past, to participate in voting, voters would have to physically be present at the elected place of vote so that they can cast their ballots. Such a drag right? 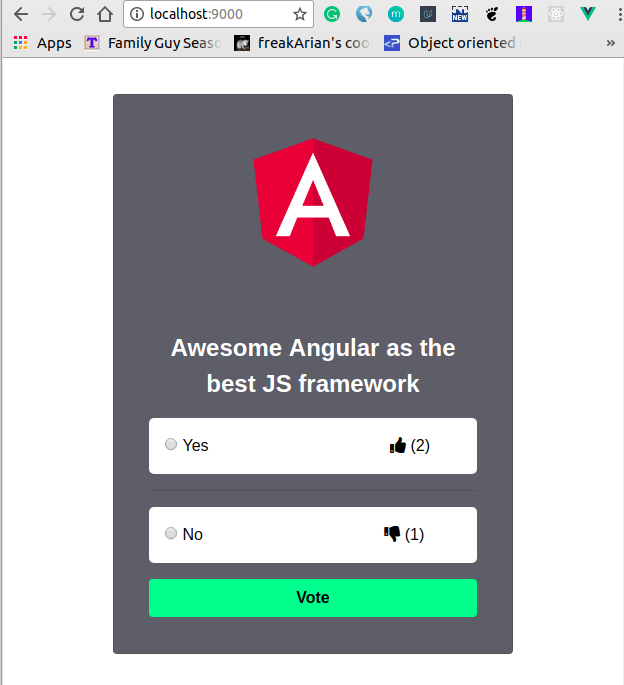 In this tutorial we will demonstrate how to build a realtime voting poll application. We will write the backend API for handling the HTTP requests and saving updates to the database (SQLite) in Go. We will be using the Go framework, Echo, to keep boilerplate to a minimum. You can think of Echo to be to Go what Laravel is to PHP. If you have prior experience using web frameworks to create routes and handle HTTP requests, the code in this tutorial should look somewhat familiar. For the frontend section of this project, we’ll use Vue.js. With its reactive properties, Vue.js will re-render the DOM whenever there is an update to the upvotes or downvotes of a vote member. We’ll also require a bit of jQuery to handle some functionality. To make things work in realtime, we’ll integrate Pusher into the application. Pusher makes it very easy to create realtime applications. Basic knowledge of Vue.js and jQuery. The directory above will be our project directory. Next create our first .go file where our main function will go, we will call it poll.go. Above we also imported the database/sql library but we don’t have to use go get because this is a part of the standard Go library. To enable Go to run our application, we need a main function, so lets create that before we think of creating the routes and setting up the database. Awesome, we’ve created some basic routes and even if they don’t do more than echo ‘static’ text, they should be able to handle matching URL requests. We included the final line because we want to instruct Go to start the application using Echo’s Start method. This will start Go’s standard HTTP server and listen for requests on the port 9000. 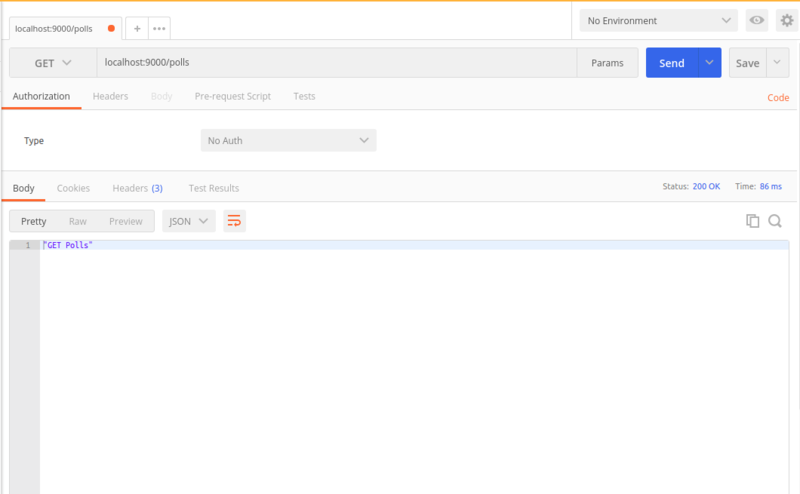 We can test the routes in our application as it is now by compiling it down, running it and making requests to the port 9000 of our local host with Postman. In the poll.go file, we will write some code to initialize a database with a filename of Storage.db on application run. The Sql driver can create this file for us if it doesn’t already exist. After the database has been created, we will run a function to migrate and seed the database for us if it hasn’t already been migrated and seeded. The first function, initDB is pretty straightforward with its task, it makes an attempt to open a database file, or creates it when it doesn’t exist. In a case where it is unable to read the database file or create it, the program exits because the database is crucial to the logic of the application. The migrate function, does exactly what its name suggests. It runs an SQL statement against the database to ensure that the polls table is created if it isn’t already created, and seeded with some initial values for this example. If we look at the project directory, there should be a storage.db file there. This means that our code executed correctly. Great, now let’s create the handlers. We’ve already created the endpoints with which the frontend can interact with the backend. Now we need to build the backend logic that will handle the received requests on specific routes. We can achieve this by registering several handler functions of our own. This is the route that will process requests sent to the / endpoint. We need this route to serve a static HTML file that we are yet to create, this file will hold our client-side code and live in the public directory. This maps strings as keys and anything else as values. In Go, the "interface" keyword represents anything from a primitive datatype to a user defined type or struct. Let’s create our handlers. We will make it so they receive an instance of the database we’ll be passing from the routes. They’ll also need to implement the Echo.HandlerFunc interface so they can be used by the routes. The GetPolls function returns the StatusOK status code and passes the received instance of the database to a model function that we will create soon. In the next section, we’ll create the models package, define its functions and import it into the handlers package. The UpdatePoll function is defined to work on a single poll, it calls c.Bind on an instance of models.Poll; this call is responsible for taking a JSON formatted body sent in a PUT request and mapping it to a Poll struct. The Poll struct will be defined in the models package. Since this handler will be receiving an index parameter from the route, we are using the strconv package and the Atoi (alpha to integer) function to make sure the index is cast to an integer. This will ensure that we can correctly point to a row when we query the database. We have also done a bit of error checking in this function, we want to ensure that the application terminates properly if there is ever an error. Let’s move on to the creation of the models package. It is a good practice to keep codebases as modular as possible so we have avoided making direct calls to the database in the handlers package. Instead, we will abstract the database logic into the models package so that the interactions are performed by the models. ID - the id of the poll. Name - the name of the poll. Topic - the topic of the poll. Src - the link to an image for the poll. Upvotes - the number of upvotes on the poll. Downvotes - the number of downvotes on the poll. In Go, we can add metadata to variables by putting them within backticks. We can use this feature to define what each field should look like when converted to JSON. This will also help the c.Bind function in the handlers.go file to know how to map JSON data when registering a new Poll. We will also use the type keyword to define a collection of Polls, this is required for when there is a request to return all the Polls in the database. We’d simply aggregate them into an instance of this collection and return them. sql := "SELECT * FROM polls"
sql := "UPDATE polls SET (upvotes, downvotes) = (?, ?) WHERE id = ?" You might have noticed we are using prepared SQL statements in the UpdatePoll function. There are several benefits to doing this. We ensure SQL statements are always cleaned up and safe from SQL injection attacks. Prepared SQL statements also help our program execute faster since the statements will be compiled and cached for multiple uses. Now that we are done with the backend, lets add some frontend code. Create a public directory in the root directory of your project. In this directory create an index.html file. This is where we will add most of the frontend magic. Above we have our Vue code. We added the created() life cycle hook so that Axios can make a GET request to the backend API. We’ve also defined two functions to keep track of the clicks on upvotes or downvotes to any members of the poll. These functions call another function, UpdatePoll, which takes the index of the affected poll member as argument and makes a PUT request to the backend API for an update. Lastly, we used jQuery to display matching divs depending on if the update request was successful or unsuccessful. Next, head over to Pusher, you can create a free account if you don’t already have one. On the dashboard, create a new app and copy out the app credentials (App ID, Key, Secret, and Cluster). We will use these credentials shortly. To make sure our application is realtime, our backend must trigger an event when the poll is voted on. Next, we will use our Pusher client to trigger an event, which will include the updates on the specific row in the database to be displayed as an update to the votes in our view. We will do this in the UpdatePoll method, which updates the state of upvotes and downvotes in the database. Above, we create a pollUpdate object that holds the data for the most recent update to a row in the polls table. This pollUpdate object has all the data required for a realtime update on the client-side of our application, so will be passed to Pusher for transmission. ⚠️ Replace PUSHER_APP_* with values from your applications credentials. Now we can build our application and see that the realtime functionality in action. In this article, we were able to trigger realtime updates on new votes and demonstrate how Pusher works with Go applications. We also learnt, on an unrelated note, how to consume API’s using Vue.js.